Germany: No Ban on Hijab anymore!! 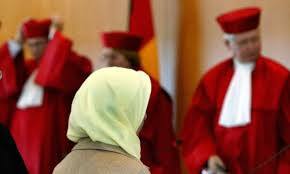 The high court in Germany has lifted a ban on Hijab ((headscarves)) for state school female teachers, stating that it is unconstitutional and saying it violates the right to religious freedom. The case was brought in court by two Muslim female teachers who had been required to wear alternative head dress. The Appellant at first brought the case against a local law in the state of North Rhine-Westphalia. But will also apply to the several other German states that have headscarf bans. It came after more than 12 years of legal struggle, and the issue already made it to the Karlsruhe state high court in 2003, when court ruled that headscarves were allowed unless banned by specific laws. That prompted many states to pass laws to ban headscarves to Muslim teachers. The court also stated a clause exempting “Christian and Western educational and cultural values or traditions” from the ban was discriminatory and headscarves ban violated the constitution’s protection against discrimination on religious grounds. The court ruled that as Christian symbols are still permitted by several regional school laws, headscarves should not be banned. Other states in the Germany also banned wearing headscarves by Muslim teachers in schools, but this ruling strike out those laws as well. Previous Post Monday Quote: Personal Insights..
Next Post Monday Quote: Its there for a reason..